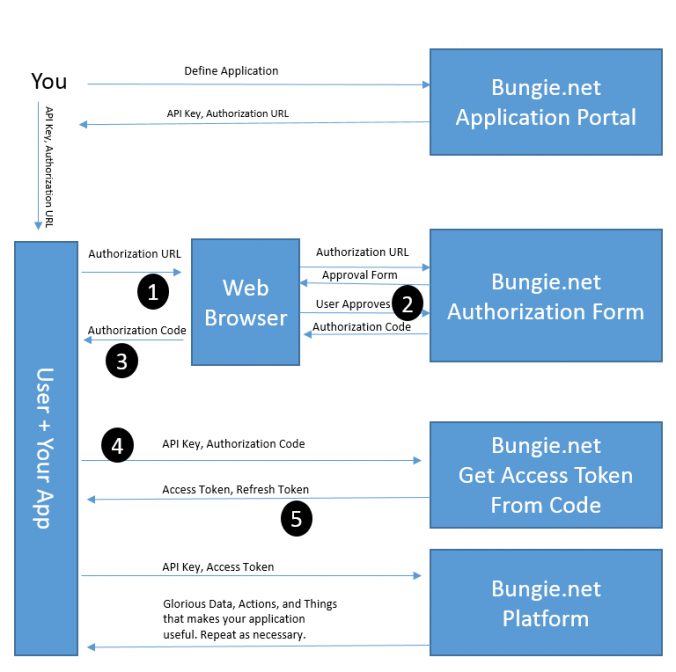 The new Bungie authentication flow! As of the 14th of December, Bungie have changed their authentication flow for the Destiny API. Bungie are moving away from the cookie based authentication flow, to the OAuth 2.0 flow. The code in the previous blog posts will still work, but Bungie will soon be switching over fully to the new authentication system. This is good news for anyone using the apps based on the Destiny API, as it is much more secure, offers the users more control over how their data is used, and what can controlled from external applications. The new Bungie OAuth flow. Creating a Python app for Destiny – Part 5: Reading a characters inventory and vault contents.